There is a growing trend in the wedding industry to serve pie instead of cake at wedding receptions. While this is a departure from the tradition of serving cake, it is not a new idea. A recent blog post by Pie&Ltd. reports that in the 17th century, the Bride’s Pie was in fact very common. The fillings that they served then are not what we would expect to find in a pie today. They were savory pies made with sweetbreads, mincemeat or mutton. As an added surprise, a glass ring was baked inside the pie and it was claimed that the lady who found the ring would be the next to marry. The tradition of serving pies at weddings gave way to serving cakes by the late 19th century and the customs changed over time as well. When I was a little girl, my Mom told me that if you put a piece of wedding cake under your pillow, (well wrapped of course!) that you would dream of the person you would marry. Many times I followed that custom, and the only thing was good about it is that I ate a lot less cake that way. Today I wanted to create a pie fit for a wedding. This is how I went about it. First, I baked gluten-free Peanut Butter Cookies. Once they were baked and cooled I crushed them in my Cuisinart and pressed them into a pie tin and baked it for 10 minutes. 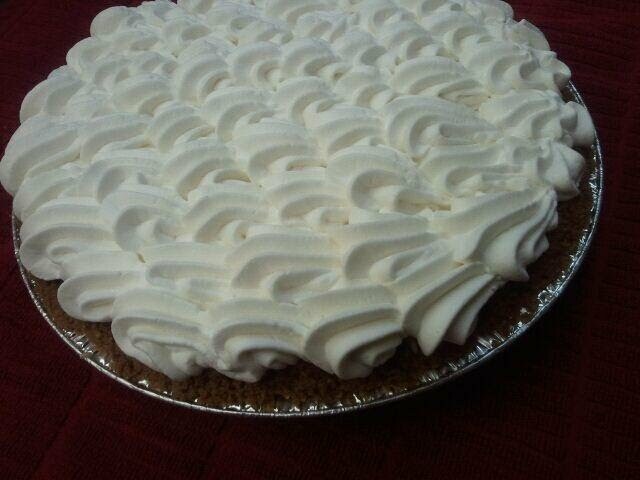 Next I took the recipe for Decadent Peanut Butter Pie and adjusted it a bit by using real cream instead of whipped topping. I poured the peanut butter mixture into the cooled pie shell and refrigerated it for about an hour. 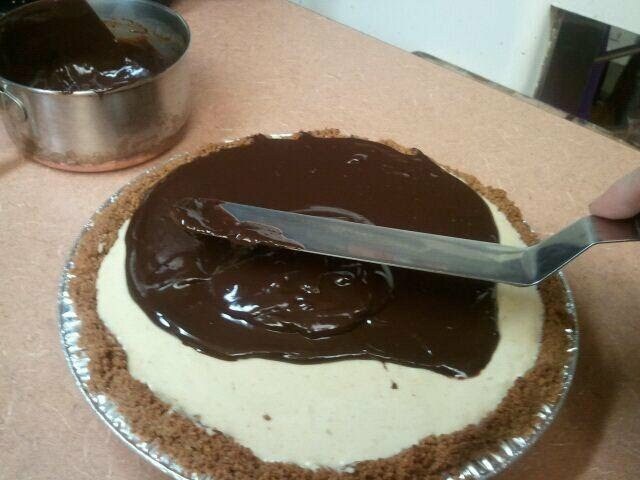 Once it was set, I spread cooled ganache over the top of the pie and put it back in the fridge for about half an hour. 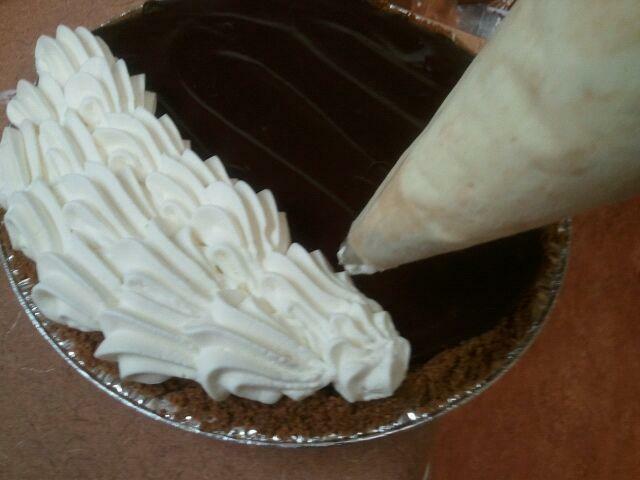 Then I topped it with sweetened whipped cream and shaved chocolate. At last I had a pie fit for a wedding! 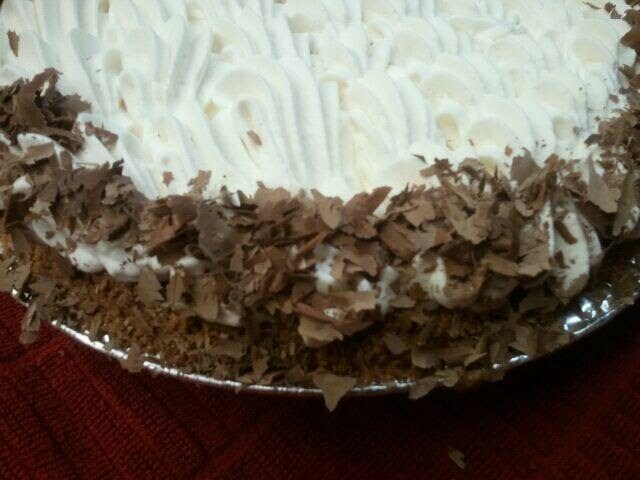 This evening I gave a Decadent Peanut Butter Pie to a couple of friends, Ryan and Savannah, for their wedding dinner. Along with it I sent my very best wishes for a wonderful life together! Great pie stand. Where can I get one? 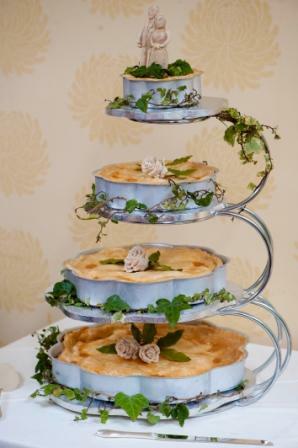 The Wedding Pie is so great but so much better with the 4 tier stand. Sorry not to have seen your comment sooner! I didn’t make the pies in the photo but instead took the photo from a company called “Pie&Ltd” in Britain. You might find out from them where to get a similar tiered stand. Or you may try to find one on Amazon (search tiered cake stand) or at a crafts store. I love your website… My daughter wants pies instead of the cake… how do I purchase the wedding pie holder? I did not make the pies in the photo… it was from a British company called “Pie&Ltd”. I have used a tiered cake stand for wedding cakes before and think that you might find something you like on Amazon. You may also go to a craft store (I go to Michaels) and find one you can decorate as you like. Or you may write to the British company and find out where they got the one in the photo.